With Altiar, users can connect quickly with the information they need, enabling organizations to improve performance and competitiveness. By providing targeted tools to help users discover content, Altiar Enterprise offers a powerful way to promote and share knowledge within an organization. No matter how your data is structured, Altiar Enterprise unlocks its true potential by transforming it into a streamlined on-brand portal. Pros: Simple, effective, easy to use, really powerful search with great sharing tools and on brand design and customization of pages really does make Altiar stand out from the competition. We now use the system in all areas of the business and it has become invaluable. The ability to send customized branded Newsletters automatically from the system to specific user groups is so easy to do, saves so much time and is a great way of sharing up to date information with users. The Altiar team are fantastic to deal with, really responsive and helpful and have made such a difference to engagement with the site by continually offering their expertise to make the most of the platform and it's features. I can't praise them enough! 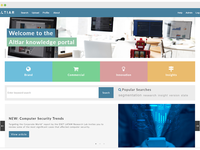 Our company works with Altiar to build and host an information-sharing website for our colleagues. Pros: Altiar has made the website intuitive and easy to use. I can quickly upload documents and tag them to multiple areas of the site. 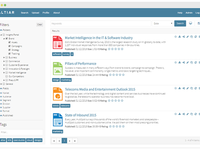 The search functionality allows colleagues to easily filter to meet their criteria. Almost more than the software itself, which works so seamlessly that I barely think about all the behind the scenes coding that makes it work so well, the timely help I get from the Altiar staff when I need to add or change something on the site or troubleshoot an issue, is incomparable. Cons: Sometimes there are changes to our site that I wish I could make myself, but my knowledge of HTML and site design is limited and the Altiar staff is so helpful and willing that they make the changes on our behalf. Fantastic customer service, very user friendly interface, a key organizational intelligence tool. 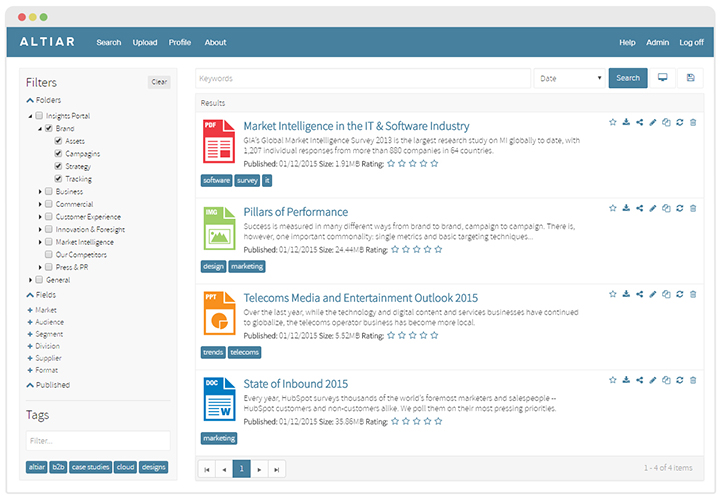 Pros: Simple yet advanced search capabilities, automated pushing of new content, easy to use admin section. 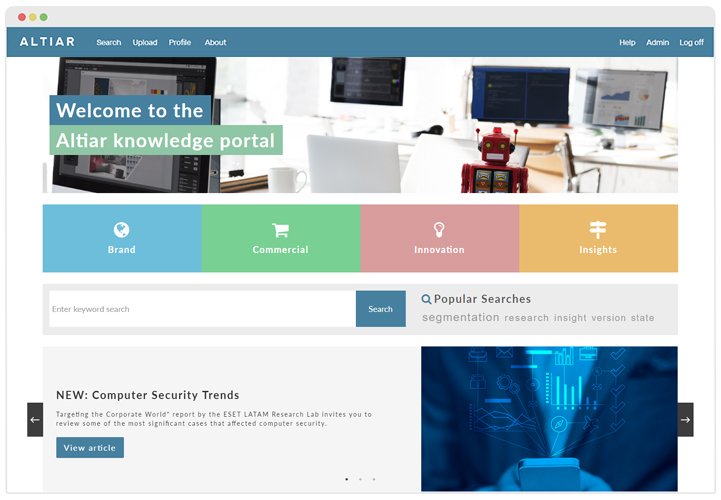 Overall: easy and fast access to massive amounts of up to date market intelligence, automation of tasks and secure storage of data, automated links to intelligence providers. Pros: - Fantastic and responsive staff to help with bigger vision and smaller tactical requests. They give multiple recommendations as solutions to what we want to achieve. Cons: Does not feel easy to change without staff assistance. Can feel a little overwhelming to navigate the admin section to change the website on first glance (as someone without a strong tech background). Comments: Altiar had a great understanding of our needs from the outset and offered a strong customer service back up process after going live. The development time was quick as the off the shelf product delivered against nearly all of our requirements. Comments: The team is amazing, they are all helpful, friendly, and never delay to help. Their contribution to develop RIO was fantastic. Highly recommended company to work with..